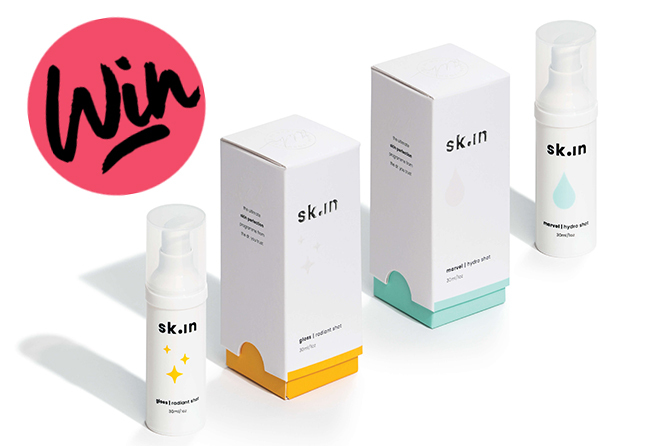 BeautySouthAfrica - Win - WIN a sk.in hamper worth R2350! sk.in is a range of high-potency serums, formulated with prescription-grade active ingredients by leading aesthetics medical practitioner Dr Alek Nikolic. Manufactured locally with the finest active ingredients, the range can be seamlessly included in an existing skincare routine, as each serum is designed to target a specific skincare concern. sk.in marvel | hydro shot (30ml, R1050): with hyaluronic acid, ceramides, vitamins C & E, sk.in marvel delivers a hefty hydro shot to drench and soothe dry and damaged skin, repair skin barrier health, protect against environmental damage and reduce signs of ageing. sk.in gloss | radiant shot (30ml, R1300): a powerful antioxidant shot to counteract signs of UV and environmental damage, including hyperpigmentation and intrinsic skin ageing. Made with super strength vitamins C & E, niacinamide, hyaluronic acid and ferulic acid ester sk.in gloss will brighten, restore and stimulate the skin. sk.in is available from salons and aesthetic practices around South Africa and online at www.skiningredients.com. For more info visit www.skiningredients.com or follow @supersk.in on Instagram and Facebook. To stand a chance at winning this amazing prize, simply enter and submit your details below. This competition is open to SA residents only and closes at 21:00 on 21 March 2019. Only one entry per participant will be taken into account for the prize draw. The winners will be drawn from all the correct entrants and notified via email. This prize cannot be exchanged for cash. BeautySouthAfrica.com’s decision is final and no correspondence will be entered into. We will not share your information with any third parties. If winners do not respond to email notification within three days, another winner will be drawn. BeautySouthAfrica.com will supply all hampers to the delivery company in good order, but will not be held liable for the condition of hampers arriving at the winners’ chosen delivery address. Please allow six to eight weeks for delivery. If you have won a prize on BeautySouthAfrica.com in the last two months, you are ineligible to win this competition.